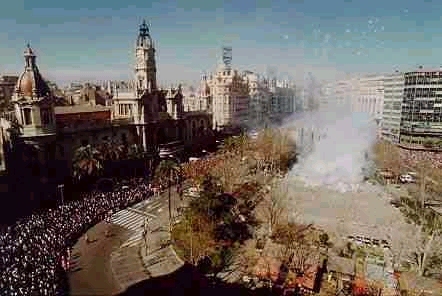 The fallas is the most important fiesta of Valencia. The name refers to the huge statues that each year are built and later burnt. The fiesta takes place in the beginning of March and lasts for two weeks. 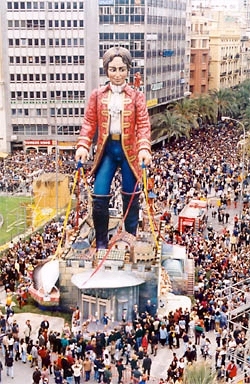 The fallas are huge works of are - like enormous statues - with a wooden structure and a surface of [gips] painted with vivid colours. 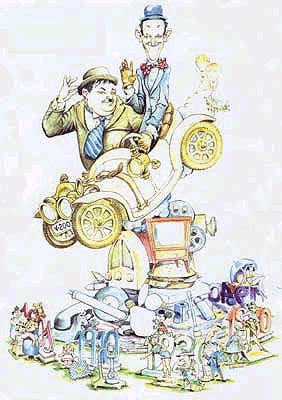 Every falla has its own theme, and the artists struggle to surpass the imagination of the others. The are societies in the neighbourhoods that are totally dedicated to making fallas. During the year the falleros are throwing off lotteries and saving money to be able to make to most beautiful falla. In total, there are some 75 mayor fallas and among them some which have cost more than 30 millions of pesetas (150.000 US dollars). 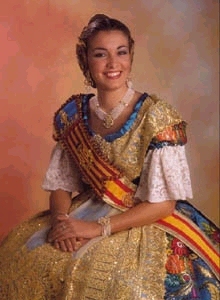 Every falla has its won falleras and falleros - people dressed in traditional clothing. You can only admire the fallas a few days, because almost all of them are burnt (read below) - the most beautiful the last. Even though it seems a strange tradition, it makes sense because there are no way to store these huge statues and if the traffic is disaster normally you can imagine what it would be like to have to cruise between dinosaurs and oversized humans all of the days. Also it's a tradition that the falleras cry. ¿Have you ever seen a fallera cry? ¡It's emotional! I advice you to take a look once you too. 'You have see a fallera cry before you can die'. Be careful with the motorcycle after having enjoyed the mascletá. The mascletá is a kind of fireworks thrown in the day. Since you can not see any colours in the day the mascletá is dedicated to making noise. It starts with some powerful explosions (at his moment the birds usually are leaving the scene), continues with more noise and finally it's like a continuous thunder which can make anyone deaf. A mascletá usually lasts between five any ten minutes. The most important mascletás of the fiesta can be enjoyed every day at 2 o'clock at the Plaza de Ayuntamiento. But remember to come in time, because more than 10.000 people are watching (and listening) every day. Many of them arrive on motorcycle, and afterwards you can view a street race which is almost more interesting than the mascletá. I have no idea why this type of fireworks is called the castillo, but I figure that it has something to do with the place from where it is thrown. A castillo normally lasts half an hour and some 500 kg of powder is used.